Chinese Consul General Pan Xinchun and his wife held a reception on Sept 26 to celebrate the 69th anniversary of the founding of the People's Republic of China, attended by more than 200 guests including Cabinet Secretary for Culture, Tourism and External Affairs, Fiona Hyslop MSP, Deputy Presiding Officer of Scottish Parliament, Lina Fabiani MSP, Lord Provost of the City of Edinburgh, Rt Hon Frank Ross, Provosts, MSPs, Councillors, representatives from other Consular Corps, delegates from industrial, commercial and education sectors as well as fellow Chinese. On that day, the Consulate General was ablaze with light as melodies filled air. The evening was permeated with warm and dignified atmosphere. 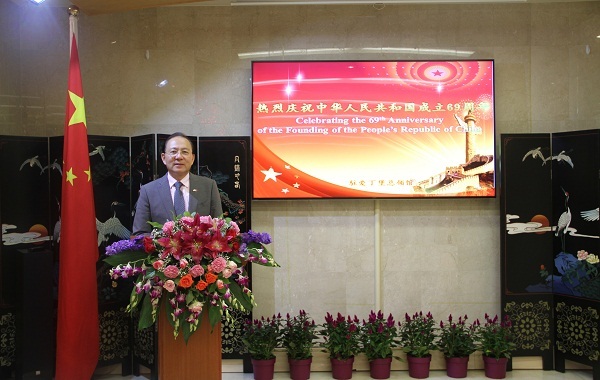 Consul General Pan delivered a keynote speech, recalling China's remarkable social and economic development since the founding of People's Republic of China and in particular the courageous endeavor and still on-going process of reform and opening-up in 1978. Its overall national strength and international influence has been significantly enhanced, with GDP per capita now exceeding $8000 and some 740 million Chinese people having been lifted out of poverty. With its economy accounting for 15% of world's total, China has grown into the world's second largest economy, contributing over 30% of global growth in recent years and becoming a key anchor and driver for the world economy. Significant breakthroughs have been made in science and technology innovation as China tops the patent application list of the world for consecutive 7 years. From this November, the first China International Import Expo in Shanghai is to be held, which will promote interconnected growth of global trade and world economy so as to realize common prosperity. He expressed that this year also marks the 5th anniversary of the Belt and Road Initiative. Based on the principle of engaging in extensive consultation, making joint contribution and sharing benefits, the BRI has garnered widespread attention and support from the international community with 103 countries and international organizations having signed 118 cooperation agreements with China on the BRI. Over the past fiver years, China's trade in goods with the countries along the routes has exceeded $5 trillion, invested over $60 billion in these countries and built 82 economic and trade cooperation zones along the routes, creating over 200,000 jobs locally. 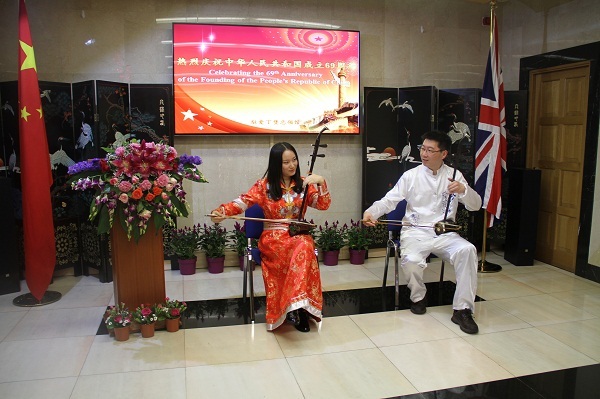 In particular, the UK is leading other major western countries to support and participate in the BRI, and train Express linking Yiwu to London completed its debut round trip in early last year. Consul General Pan stressed that China-Scotland relations have made new progress over the past year with many senior official visits including Vice Premier Liu Yandong and Member of the Political Bureau of the CPC Central Committee, Secretary of the Beijing Municipal Committee of the CPC, Mr. Cai Qi. First Minister Sturgeon paid another successful visit to China in April. These high level visits achieved fruitful results and strengthened China-Scotland collaborations and exchanges across various fields. Scottish Government issued a new China Engagement Strategy in June, putting China on priority for its international engagement to ensure Scottish Government development strategy chime with China's 13th Five Year Plan. The first ever direct flights between China and Scotland began on 12th June, greatly facilitating the deepening of exchange between the two peoples and the strengthening of cooperation. The two-way trade between China and Scotland grew steadily, with China now one of Scotland's largest exporting markets and a major importing partner in 2017. Moreover, China is for the first time a top five source of inward investment to Scotland. The people-to-people and cultural exchanges between two sides are flourishing as Chinese Giant Lantern Show and Chinese New Year Concert were held with great success. A new Chinese Pavilion stood at Royal Botanic Garden Edinburgh in April. During the Edinburgh Festival Fringe this year, China Focus Culture Week was successfully held with over ten Chinese art troupes bringing brilliant performances to the Festival. 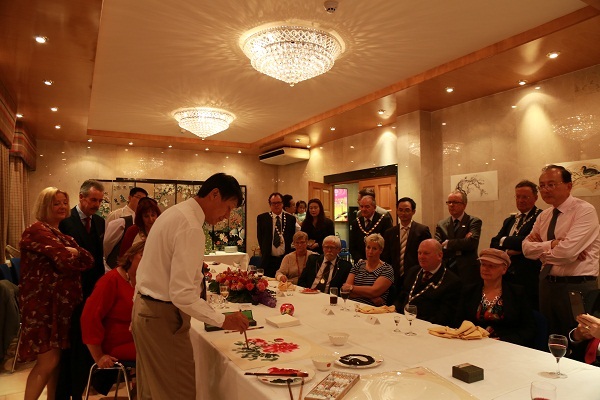 The Confucius Institute in Scotland developed rapidly, making Scotland's coverage of Confucius Institutes and Confucius Classrooms one of the world's highest. During her visit in Beijing this time, First Minister Sturgeon announced £754,000 of Scottish Government funding to support more young people from Scotland to live and study in China. 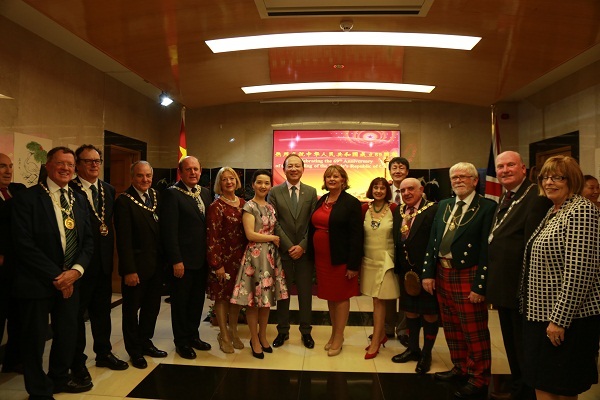 Consul General Pan concluded by extending sincere thanks to all the Sottish friends and fellow Chinese for their contribution to the development of China-Scotland relations and encouraging both sides to seize the China-UK golden era to push the relationship to a new high and bear new fruits for the benefit of the peoples. 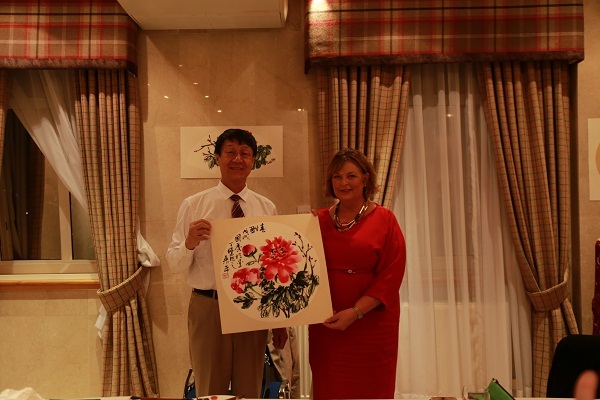 On behalf of Scottish Government, Cabinet Secretary Fiona Hyslop sent a holiday blessing to Chinese Government, its people and Chinese communities in Scotland. 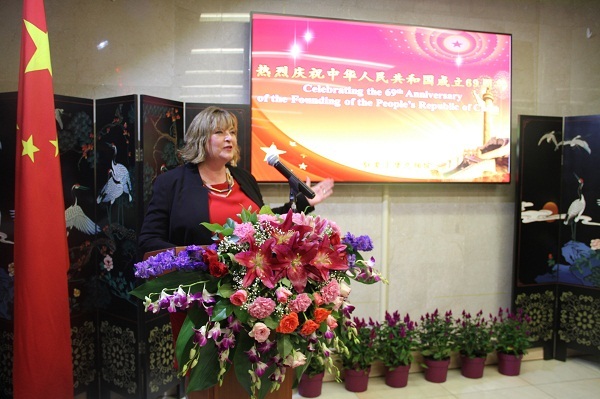 She said that the relations between Scotland and China had shown a vigorous momentum of development and produced many results in high level and people-to-people exchanges, trade and investment, education and technology. Cabinet Secretary noted that Scottish Government would deliver achievements made during First Minister' s visit to China and focus on new China Engagement Strategy so as to cement the foundation of the friendship and promote the level of pragmatic cooperation. 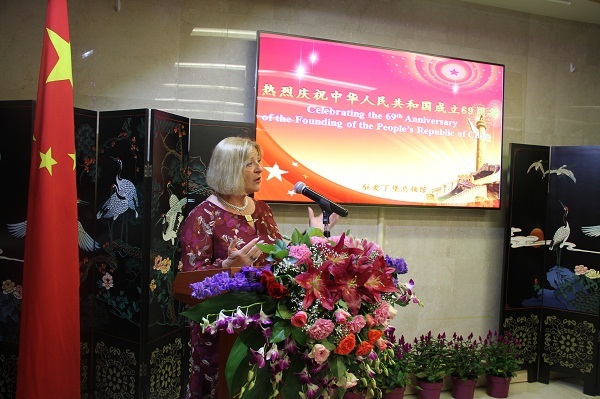 Deputy Presiding Office Linda Fabiani said that guests gathered here tonight not only to celebrate the national day but also to acknowledge the growth of good relationship between two sides. Scottish Parliament has built close contact with National Peoples's Congress of China, maintaining exchanges on education, health and environment issues since its establishment. She herself welcomed NPC Foreign Affairs Committee Delegation last December at the Parliament. Cross Party Group on China has made contributions to the engagement and cooperation between two sides with the help of the Consulate General. She expressed that Scottish Parliament would work closely with its Chinese counterparts to advance the relationship and benefit the peoples. Rt Hon Frank Ross commended China's development achievements and the friendly relation between China and Edinburgh. 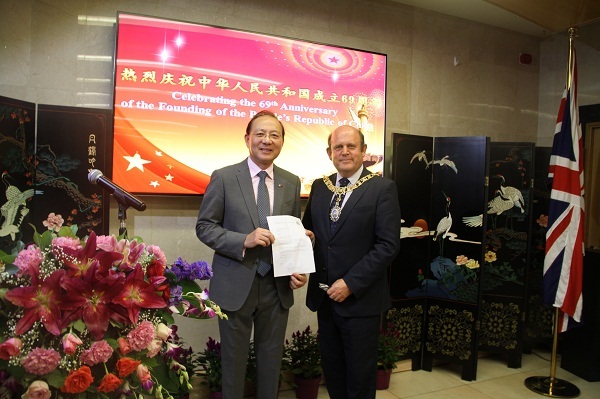 He announced that The Royal Company of Merchants was pleased to offer Consul General Pan the singular honour of joining the Association of Assistants to mark his significant contribution to the business and civic life of Edinburgh. During the reception, to showcase the rich Chinese culture, traditional Chinese painting exhibition by Chinese painter Mr. Hu Leping was held, videos about Chinese development were played, Chinese classic music instruments performed by students from Heriot-Watt University, wining big applause and warm appraisal from the guests.